The Wii U eShop faces frequent criticism of being overrun by 2D platformers. While there certainly are a lot and there are even more on the horizon, a number of developers are working to make the eShop a more varied platform as other neglected genres see new representatives released. One-man indie developer WizByte is one of the latest to join this trend with his first game, the twin-stick shooter offering, Vector Assault, but a myriad of issues keep it from making any real impact on the eShop, despite very little direct competition. Before we get too far into things, it needs to be said that the game isn’t all bad, and we’ll touch on its better points soon, but there is one major issue that should be addressed right away: the menu. When you start Vector Assault, you’ll be immediately greeted by simple white text on a black background with softly chirping techno music bouncing through the speakers. None of these are deadly sins on their own (though they’re not the kind of design choices you expect from top-quality releases), but after a brief moment, everything becomes much worse. The static black background quickly begins to throw thousands of bright, multicolored lights straight at the screen like a much, much faster technicolor version of the old Windows 98 “Starfield Simulation” screensaver. You know the one (https://www.youtube.com/watch?v=L9Hnc3xp_DY). Combine this with an irritating music loop lasting only a few seconds and a needlessly confusing menu navigation system that keeps players starring into the rainbow abyss far longer than necessary and our reviewer was forced to turn the system off before even playing Vector Assault on his first try. Granted, the game may not inspire the same level of stomach-churning vertigo in all players, and those with stronger constitutions may find no issue with the menu’s aesthetic choices, but the problem was strong and persistent enough that we felt gamers prone to nausea should be warned. This can be a very strong deterrent from spending much time with the game when you're bound to see the menu a lot. The absurdly convoluted game menu. Instead of using the D-pad and A button to select options from the menu different settings are assigned to different shoulder or face buttons and, rather than choosing your highlighted option, pressing A always moves your cursor back to the default position. "And when you gaze long into an abyss the abyss also gazes into you..."
Once you get past the menu, you’ll find a rather simple shooter that—despite four game modes, three unique playable ships, two-player cooperative multiplayer, and online leaderboards—does very little to stand out in a player’s mind. The game allows players to choose any mode and any ship from the jump; there are no unlockables in Vector Assault. Beginning with the ships, the standard ship moves at an average speed, takes two hits, and fires medium-strength bullets in a straight line. The second ship moves quickly, but can only take one hit and fires weak projectiles that pass through enemies and return to your ship in an arc like a boomerang. The final ship moves very slowly, but can take three hits and fires strong missiles with slight homing capabilities. While this sounds good on paper and seems as if it would lend itself to varied playstyles, the execution falls short as ultimately all but the quick second ship are too slow to keep you alive for very long. It simply becomes an incredible feat to dodge anything, especially in the third ship, and because the action ramps up very quickly in Vector Assault, most players will not be able to stay in the game for very long. Extended play is certainly possible, but you will need to pray for a bit of luck from powerups spawning frequently and accessibly. 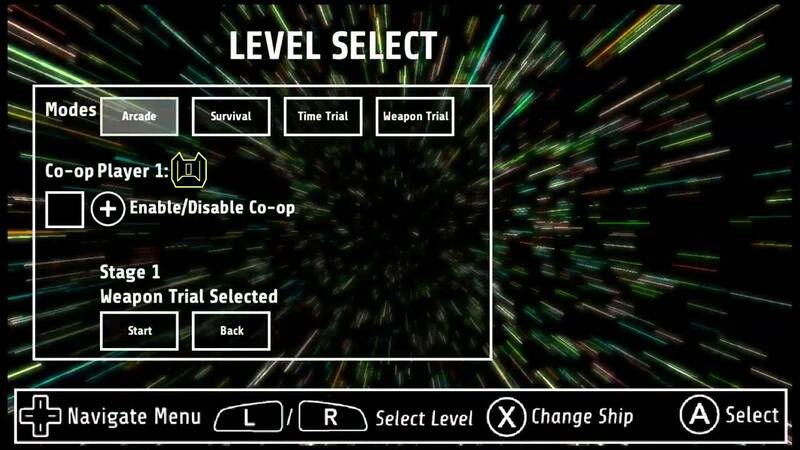 In terms of modes, you can choose between the standard Arcade, Survival and Time Trial modes, as well as the missed potential that is Weapon Trial, and one of nine maps on which to play each one, but the game, again, undershoots the mark in executing these varied ideas. Arcade gives you three lives as you wage war against wave after wave of enemies, as you try to get a high score in each batch to create a cumulative high score. Survival does away with separating waves of enemies, instead continually building the challenge until you lose the two lives you’re given. Time Trial puts five minutes on the clock and offers unlimited lives to reach the highest score you can, with the only caveat being that every death resets your score multiplier. And the peculiarly titled Weapon Trial boils down to a mix of Survival and Time Trial, placing one minute on the clock, but giving you the ability to extend that time by picking up two-second additions dropped by slain enemies. When time finally runs out, or you lose your one life, it’s game over. The mode’s central hook, then, of grabbing time extensions and weapon powerups to continue playing is interesting in theory, but all the other modes revolve around claiming the score multiplier orbs dropped by enemies, which is the same action required to collect the time orbs, so the gameplay essentially does the same. Also strange is that rather than ending immediately when the timer hits zero, the player’s ability to fire is shut off, but they are still allowed to move about the stage. This led our reviewer at first to assume that the mode was about racking up as much damage as possible in the minute (plus extensions) allotted, then staying alive weaponless for as long as possible. This would also make sense for a mode called Weapon Trial. After only three bulletless seconds, however, the gameplay suddenly ends, making the mode in essence a one-life version of Survival, but we would be lying if we didn’t say our original assumption sounds like a more interesting variation than the one actually offered. The various arenas in the game do little to shake up the experience, keeping the solid walls on all sides and altering only the shape and size of the playing field. It’s nice to have to option to play in a smaller space for increased challenge, but your max score in one stage is not likely to differ greatly from one to another. This is a fairly tame moment from Vector Assault, but even now can you immediately tell the good neon things from the bad neon things? Like the game modes, in-game objects have an unwelcome tendency to blend together. Aesthetically, the game takes heavy inspiration from the last-gen indie hit Geometry Wars, with all asteroids, ships and projectiles taking the form of relatively simple, neon outlines. This is not a bad look, but it’s also not a great one. 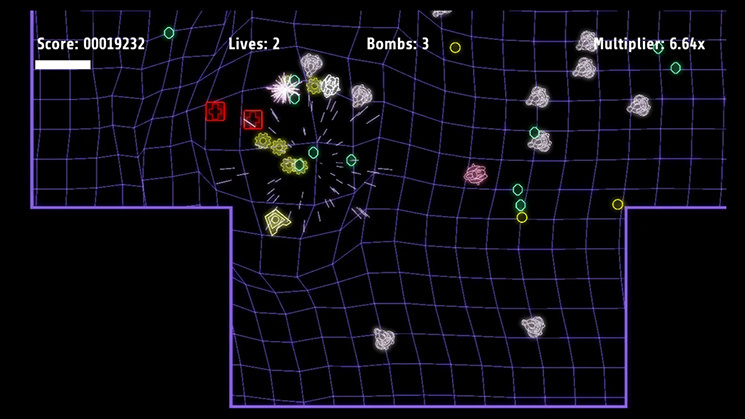 Everything on the screen is a different color, which may sound like it helps to distinguish hazard types, but when the screen fills up, it becomes harder and harder to tell your ship and your ship’s bullets from the ships, bullets and flotsam around you, and to visually separate the slow enemies from the fast ones. The art style is also a little unoriginal in 2015, as well, nearly copying other well-known games, but lacking their panache. Games like Geometry Wars or Google Play favorite Pew Pew feature a plethora of eye-catching firework explosions and satisfying pews and pops upon firing bullets or killing enemies. Aside from a neat ripple effect your shots create in the map’s background, Vector Assault brings none of the same satisfaction to its battles. And the game’s one gameplay song is as short and annoying as its one menu song, so players are advised to plug their headphones into their iPod, rather than their Gamepad. On a technical level, the game is also hit and miss. The co-op play actually operates fairly well, putting one player on the TV and the other on the Gamepad with little loss in performance, which is commendable for the small developer. Such two-screen gameplay is too often overlooked even by big teams with big budgets, so we were happy to see it included here, and appreciate that this and single-player off-TV play are available for all modes. That said, players will encounter some slowdown from time to time (though it’s rarely too detrimental), and accessing the online leaderboards caused our game to crash on about 30 percent of attempts. Bad luck on our end, perhaps, but it’s an issue to be aware of. All in all, Vector Assault should be considered an impressive offering from a single creator. In a world where even “indie” games can have dozens of full-time professionals in the credits, and games like Cave Story show what amazing things one extremely talented individual can do, it’s all too easy to scoff on mediocre games that come across our digital marketplaces. It’s worth remembering, now more than ever, how little the vast majority of us would be able to do compared to these developers, and we should continue to encourage bold, new talent to take risks by releasing their small passion projects. But while we always applaud hard work, our responsibility to gamers makes it hard to recommend a game that does so little to set itself apart in a progressively crowded library. And while price is a miniscule factor in our review scores, Vector Assault’s $4.99 launch price makes it even harder to recommend, as the eShop has so many other higher-quality options available for little to no more. If you’ve had your fill of Ultratron and absolutely need a bit more twin-sticking, you may consider Vector Assault. But most will want to wait for a big sale (if not for WizByte’s next attempt) before assaulting these vectors. @bro2dragons Wow! What a detailed review! Thanks for publishing this amazing article. @bro2dragons The way you described the menu has already put me off the game, and I've never even heard of it. @Rukiafan Of course. That's what we do. Most trustworthy reviews on the Web, righ? By gamers, for gamers. @GamerZack87 Yeah, I really hate to knock points over a menu and, as I said in the review, I'm sure the majority of those who play won't notice a thing. But my nausea was a consistent reaction based solely on the menu screens and that felt like a big enough thing to be mentioned up front. It certainly keeps me from wanting to revisit the game, so I imagine others would feel the same. I'd say if a game or video has never made you queasy, you're probably fine, but for me, it's a huge factor. @bro2dragons wrote: @Rukiafan Of course. That's what we do. Most trustworthy reviews on the Web, righ? By gamers, for gamers. I experienced the same issues of queasiness and the only other game I ever had that issue with was Kirby's Air Ride. Needless to say I have no intention of playing this game again! The menu screen didn't make me feel sick, but the game did give my eyes a case of eyestrain. Who's @Khaleesi? @bro2dragons wrote this review. What a review! Wow nice work @bro2dragons! Nice review, too bad the game wasn't very nice. I completely agree with the reviewer, if you want a shmup there are much better choices currently available on the eshop!